How will it fit into my space? The first step in customizing your phone charging station is selecting the perfect size. 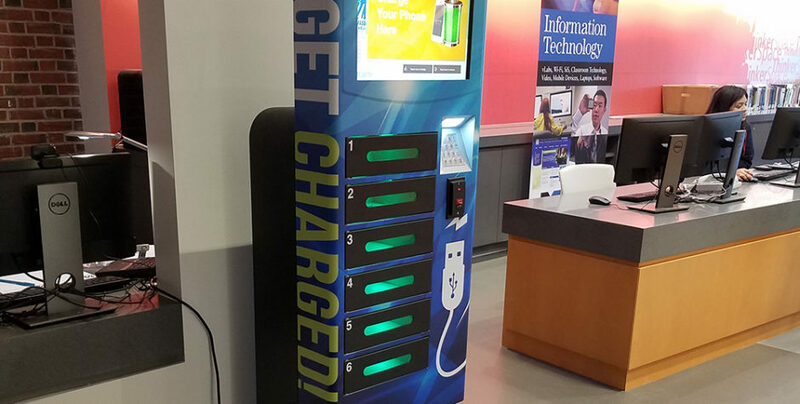 Most charging station companies offer several options from locker kiosks to convenient portable chargers that can be placed on a table or counter-top. Each station provides safe and secure charging for your customers. For larger spaces, like a hotel lobby or convention center, you might want to consider a locker charging station. Their larger size makes them easy for customers to spot from a distance, and you can select the number of lockers to meet your needs. For bars and cafes, a portable charger can conveniently sit on the counter-top, making it hard for customers to miss when they sit down at the bar. They’ll be able to easily access their phones while they charge without ever leaving their seats. How will customers know it’s your phone charging station? Once you pick a charging station, it’s time for the fun stuff. Help customers spot your charging station with ease by choosing colors that stand out when adding decals and a custom wrap to show off your brand name or logo. Feel free to deck out the entire station, from the face-plate and backdrop, to the sides and even the battery packs. When it comes to your charging station, you can customize every piece of it to better broadcast your brand and make it stand out from the crowd. What will customers see and hear? Custom branded charging stations are an excellent way to advertise for your business and your sponsors. Locker charging stations feature 19” touch screens where you can showcase whatever you prefer. Give your customers more detailed information about other products or services you offer through a slideshow or video. Our charging stations have LCD blue lights that show when a station is open and red LCD light when there is a phone is plugged in. LCD lights attack many people because it stands out, allowing people to focus their attention on the advertisement the station is wrapped in as well. For hotels, airports, and trains stations where a lot of people are coming and going, the screen is a great place to feature your sponsors or nearby businesses. If your hotel guests frequently ask the concierge about where to grab a bite to eat, you can feature restaurants you recommend in the area, with menus and photos to keep them salivating. If you have sponsors that are interested in advertising, you can give them some screen time as well. The locker charging stations also come with built in speakers which allow you to incorporate audio into your advertising. Your audio can help explain or describe the product alongside the images on the screen, or you can play some music to set the mood. Keep things from getting dull by switching them up every once in a while! The screens can easily be changed by using remote access or by simply inserting a flash drive. How will customers access their phones? Locker charging stations can also be customized to allow customers a convenient way to access their individual compartment. More and more college campuses are installing phone charging stations to keep their students connected. By equipping your phone charging stations with student ID readers, students can charge their phones with the one thing they never leave the dorm without. You can also select to have a physical keypad or a credit card reader. Credit card readers make charging your phone simple–just swipe and you’re in! With a physical keypad, customers will create their own personalized code to access their locker, giving them added security.